The first 1,000 cheese lovers through the doors at The Great Canadian Cheese Festival will receive a free sampler of fresh cheese curds made by St. Albert Cheese Co-operative earlier in the day. It’s one of the many ways we’ll be celebrating the fifth anniversary of the biggest cheese show in Canada. It also celebrates remarkable recovery by St. Albert Cheese Co-op from a devastating fire two years ago. 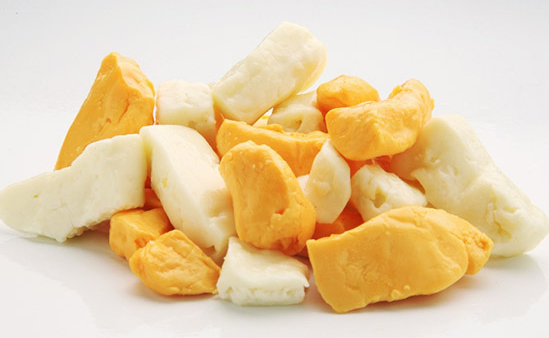 The free cheese curds will be available on Saturday, June 6. We have another giveaway in the works for Sunday, June 7. • Sample and purchase more than 150 outstanding Canadian artisan and farmstead cheeses from 30+ Canadian cheesemakers coast to coast. • Plus artisan foods, plus fine wines and craft beers, plus a food court. In total, more than 500 different cheeses, foods and beverages on offer. • An insulated Festival cooler bag for hauling fromage and other purchases home. • Glass for sampling wine and beer for 19+. • Admittance on first-come, first-served basis to seminars in the All You Need Is Cheese Annex presented by Dairy Farmers of Canada. • Live music by Starpainters duo. Click here for a sampler. • All You Need Is Cheese magazine courtesy of Dairy Farmers of Canada. • A photo op with Yvette, a water buffalo, in the Festival Dairy Farm. • Special admission pricing for seniors 60+ and groups. • Families are welcome with children 15 and younger admitted FREE when accompanied by an adult. Visit CheeseFestival.ca for complete information including special events such as. For assistance, email info@cheesefestival.ca telephone 705.632.1503. Plan to make a weekend of it in Prince Edward County, as one day won’t be enough to sample all 500 cheeses, foods and beverages on offer—and see all that the County has to offer: Three dozen wineries, two cheese plants plus spectacular Sandbanks Provincial Park. Find accommodations to suit your tastes and budget by clicking here. For assistance, telephone Prince Edward County Chamber of Tourism & Commerce at 1.800.640.4717. Spread the cheese love. Use the hashtag #TGCCF when tweeting about the biggest cheese show in Canada.